With university just about start again, everyone returning and a large intake of freshmen as always, it’s probably a good time to inform/update and even remind you all of UC’s official online communication channels. The channels help keep you updated on important information, useful things that you really should know and even some good gossip on and about campus. Personally, I think UC’s official website is the best way to keep yourself in the know, as being the main page it has all the information and links to all other communication channels. It’s like a homepage to UC that helps you navigate to all other related pages. Other than this, there’s always UC’s Facebook page, YouTube channel, LinkedIn page and Twitter account (@ucnz) to help keep you updated on the go. Two other official channels owned and monitored by UC are #UC Now and this Insider’s Guide to UC blog. These take a more informal, student-oriented approach and are aimed towards engaging the student body with all the developments on campus. Other useful official pages that are not managed by the University are the UCSA’s website and Facebook page (fb.com/theUCSA). This is the best site to follow to keep up with all the events hosted by the UCSA all through the year. Then, there’s always all those unofficial groups and pages on Facebook (ahem, you know which ones I’m talking about) that are mighty useful and informative to an extent. 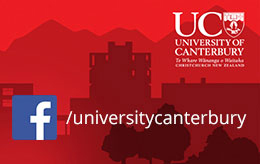 Even with all these options, it’s a good idea to follow this page closely, as it has a comprehensive collection of all things Canterbury and has a range of bloggers from UC officials to seasoned UC students. If you don’t manage to jump onto the blog, watch out in your email for a useful Insider’s Guide to UC weekly bulletin; this is a great summary sent to enrolled students throughout each semester. The Insider’s Guide is always open to new voices to write captivating guest posts about things that students really want to hear. If you’re interested in writing guest posts just send an email to insidersguide@canterbury.ac.nz.